The sad truth is that there is no magic solution to promoting your book. No one course of action will get it to sell consistently but there are lots of individual actions you can take, both simple and complex, which will help. You can spend a fortune on promotion and get nowhere. There are expensive courses available to teach you how to be a ‘bestseller‘ but you’ll be lucky to make more money than you’ve spent even if you are a ‘bestseller’. Strange as it may seem you don’t even need to write a good book! There have been many best-selling books which are full of mistakes, have a poor plot and will never be acclaimed as literary gems. The most important factor in author success is one you can’t buy—Luck. Despite that there’s an old saying which applies—The more I practice, the luckier I get. Get a remarkable cover which attracts the attention of readers browsing for books. Few can do this themselves so it is worth spending money on this. A good cover will give a book browser the interest to check out the book. Spend a huge amount of time and effort getting a book description which makes the reader think “Wow! This is a book I have to read.” Your description should use emotive language and use your keywords. Try running the sentences through a headline analyser. Use the right keywords/tags. If you have problems here, steal them from the top selling books in your genre. To do that create a blank book in calibre and in the meta tag ID section paste in the ASIN number of a top ranking book in your genre. Then download the meta data. You’ll get the tags and the book description. Make sure your book starts with a powerful hook to keep the book browser reading. Your book’s first three pages should be gripping. Video, pictures, headlines and subheadings are effective in promotions in that order. Run headlines and sub headings through checkers for emotive language such as http://www.aminstitute.com/headline/index.htm and https://coschedule.com/headline-analyzer. This works for Tweets and Facebook posts too. Make sure promotion pages have a clear ‘call to action‘. Recognise that a promotion at best will produce a spike in your sales but you need to sustain that spike for at least a month for it to produce a rise in your sales rank at Amazon. You’ll need to stagger effective promotions. Know that not all promotions are effective and some are downright scams. There is no point in tweeting to fake accounts or putting book links on sites with no visitors. See this post. Learn how to recognise the fakes and how to use UTM (Urchin Tracking Module) codes to spot those sites which work. Facebook adverts work but NOT ‘Buy my book’ adverts. Instead make an attractive offer which people can get if they add their email address to your mailing list. Email lists are effective at selling books. Twitter posts work but not until you have 10,000 real, active followers. Few will see your posts. People will unfollow if your posts are solely ‘Buy my book’ posts. These should never make up more than 10 – 15% of your feed. DON’T auto follow-back because you’ll end up with fake followers; vet your followers. Never send out ‘Thanks for following me’ direct messages. Aim to get 100 new followers per day. Remember people are only on Twitter for short periods of time so the vast majority of your tweets will be unseen. Make sure you have a pinned post there. Twitter and Facebook are NOT the only social media platforms. Get a presence on Tumblr, LinkedIn (if you write nonfiction), Google+, YouTube also. There are also vital forums such as Kboards. Although I dislike Goodreads, it’s an essential platform for an author to be on if you want recognition as an author. Be careful what you say—lots of Trolls there. Amazon paid advertising appears to work. Preorders work for new books, especially if you follow them with promotion during the release week. If you are not using affiliate accounts you are wasting an opportunity to earn at least 4% extra at Amazon and much more elsewhere. You can use this as a sales tool too. Remember there are only 24 hours in a day and you can’t do all of this at once. Some can be automated though. Ask people to help you promote! Hey if you have not already downloaded one of my free ebooks (Immortality Gene and Raging Storm) please do so. Even if you don’t read them it will help my sales rank. Darn that all sounds complicated. Maybe there should be a magic promotion button. I’m working on it but it’s not quite finished yet. Take a look here. This seems such a good deal for authors and musicians. MineEye is very new and offers to act as a retail outlet and to promote your e-books and music. It’s a concept which deserves to work – time will tell. Momentous News – The Launch of MineEye. For some while, you will know that we have had the vision of creating a community of writers, poets, musicians and artists in a strong web and social media network, capable of bringing together people from all over the world. That community is called ‘MineEye’. We want to create a nurturing, positive and supportive environment for people to express themselves, develop and connect with their audience. Getting started as a writer is challenging enough personally without having to understand and engage with multi-national print publishing houses and online bookstores – mentioning no names ! This first phase is an online bookstore with a difference. This will allow writers to publish their books on our website for a small fee to cover our administrative costs. We will not charge percentage commissions from the sale of books on our site – ever. Whether an author sells 5 books or 10,000 books through MineEye, they get to keep every penny, every cent of their earnings. Most importantly, our community of authors will be actively promoted by us. We have a wonderful, positive presence on social media and we have a powerful voice now – we are a force for good ! No longer will authors’ works be left languishing unknown and unread amongst literally millions of others in the catacombs of a multi-national company. So now, with the MineEye website ready to launch, we need authors (and their books to sell) and customers to buy them. We will start small and understand that it will take many months to grow. How can you help ? If you are a writer or you know someone that you can recommend, with a book ready to be published, we would love to hear from you. We went to attract our first “scribble of writers” – precisely 30 of you to start with. To those 30, we will offer a free subscription for one year and will upload your book onto MineEye free of charge. You will receive 100% of your revenue from book sales. There are no strings, no hidden catches – we want to build our community. Please note that this is an online bookstore where customers will buy and download your book, then send it to their Kindle or e-reader device. We cannot sell books in print because we don’t have a warehouse – yet ! Also, we ask that your book is complete in every respect – it needs to have been converted to an e-reader format before we can publish it and you will need great looking artwork, plus a few promotional paragraphs of text, so that we can help you sell your book. We are really delighted to be ready to launch MineEye and look forward to getting our first wave of writers on board immediately ! Authors can sell their books online to customers today. Please contact us by email at either: gavin@mineeye.co.uk or robert@mineeye.co.uk if you would like to talk to us about publishing your book on MineEye. Every day my mailbox is bombarded with marketing emails from people who want to help me become a ‘bestseller’ but what exactly is a ‘bestseller’? Now if the promoter was able to say he’d got 3 books in the top 100 paid sales rank I would be very impressed and he would undoubtedly be a stellar bestseller. He didn’t say that though and if his book genre was Kindle Store > Kindle eBooks > Foreign Languages > Other Languages > Hungarian he could be a ‘#1 bestseller with an overall rank of 1,287,139. That would mean he’s selling about one book every 1-2 months. There a lot of these obscure categories so when you see these ‘#1 bestseller’ claims – take it with a pinch of salt. If the promoter’s system really works well they would quote the Amazon overall sales rank. You’ll find many authors claim to be a ‘bestselling’ author if they have ever had a book in the top 100 of any category, Look for #100 in some genres at Amazon and you may find they stop at #18. That probably means the book in that rank has sold just a few copies. As to me I’ve been #1 bestseller in Kindle Store > Kindle eBooks > Mystery, Thriller & Suspense > Thrillers > Technothrillers with a best ever overall rank of #540 in paid. I’ve also been #1 in Science fiction > Genetic engineering and #1 in Science fiction adventure. I don’t claim to be a bestselling author even though there are 50,000 of my books in circulation. Beware the ‘bestseller’; it’s a word which can mean little and for an author to use it smacks of desperation. What’s the purpose of your author blog? Isn’t it to get people to buy your books? If so then at the very end you need a clear ‘call to action’ – something to leave your readers with an immediate ‘Yes, I must do that’ thought. Want an example? I’m happy to oblige – just scroll down to the end of this post. So what should be in a CTA? Clearly separate it from the rest of your blog. I use a table for mine. It’s easy to construct using some simple HTML. Uh huh I can hear some of you thinking, I don’t know HTML. How do I do that? Easy. I’ll show you how to do this in Blogger but if you use WordPress, the process is similar. Step 5 – Return to the normal ‘Compose’ screen. 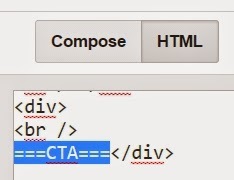 You’ll see a CTA box which you can now edit to show your own text and links. Step 6 (Optional) – If you wish change the blue arrow picture with an image of your own choice which may be more in keeping with your blog style. Here’s a few more which you can copy and use if you wish. Have fun with your calls to actions. Adding one will have an effect on your ‘clickthrough’ rate and get you more sales hopefully. Please feel free to add your comments and if you find this helps with your promotion please come back and tell us about it. (You can even add a link to the page you’ve put a CTA on. There are two things left for me to add. 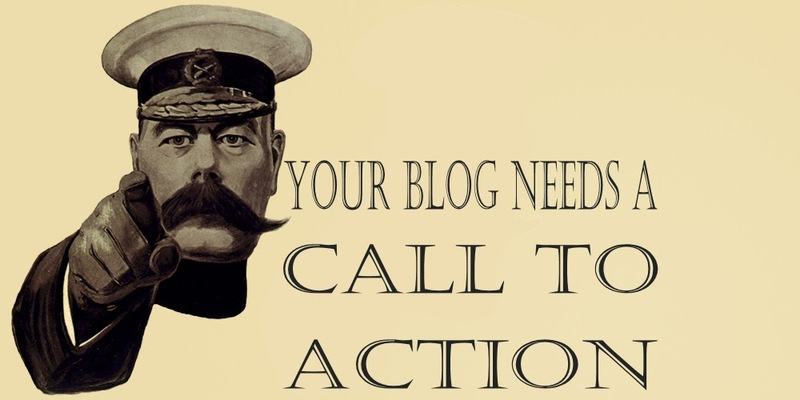 The first is a ‘thanks’ due to Molly Green, whose blog post ‘How to build a perfect blog post‘ reminded me that I’ve been meaning to write about ‘Calls To Action’ for some time and the second is, of course, my Call to Action.